Padlocks are portable locks with a shackle that may be passed through an opening to prevent use, theft, vandalism or harm. Brass padlocks with a stainless steel shackle makes an excellent lock for applications where moisture is a problem or will be present. They come with hardened boron steel shackles that are zinc plated. The lock cylinder uses the Abloy disc locking principle that can use a patented key and keyway. 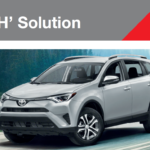 Long Shackle Padlocks is important to strike the right balance between reducing the amount of exposed shackle and allowing sufficient clearance for your purpose. 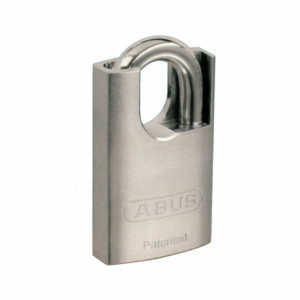 Aluminium padlocks are suitable for a variety of applications. They are handy, lightweight and protect your valuables reliably. Whether blue, red, violet, green, orange or yellow, whether a combination lock or key lock, you are guaranteed to find just the right padlock in this product range to suit your needs. ABUS Granit™ padlocks meet highest security standards and are considered to be among the most secure padlocks in the world. Their tensile resistance is over 6 tons. High-quality materials and careful finishing are the basis for the quality of these padlocks that are made in Germany. Versatile Discus Padlocks that have a curved shackle that encompasses the entire body of the lock. This gives a resistance to attacks from tools such as bolt cutters. Closed Shackle Padlocks. Padlocks are a good security solution, but the design of some padlocks means that the shackle can be easily accessed and cut into with saws or bolt cutters. A stronger and safer design is the closed shackle padlock, which is designed to expose as little of the shackle as possible. Patented Padlock with a stainless steel shackle makes an excellent lock for applications where moisture is a problem or will be present. They come with hardened boron steel shackles that are zinc plated. The lock cylinder uses the Abloy disc locking principle that can use a patented key and keyway. A combination lock is a type of locking device in which a sequence of symbols, usually numbers, is used to open the lock. Types range from inexpensive three-digit luggage locks to high-security safes. Unlike ordinary padlocks, combination locks do not use keys. 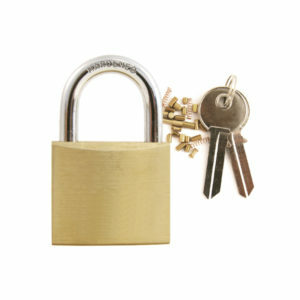 High Security Padlocks for general use are made of hardened steel and solid brass. These padlocks have a protective shutter to prevent dust contamination and drainage holes to prevent freezing, creating a highly durable locking system. The Iron Padlock is a type of low-security padlock that is popular for its reliability. 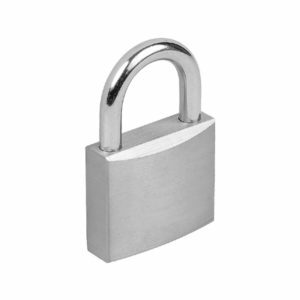 We supply the Iron Padlocks in several variations, including iron and open shackles. Our Iron Padlocks are supplied with 3 keys as standard and tend to be used for internal applications. Safety padlocks serve to lockout a specific piece of equipment or machinery, or even an entire area during preventive maintenance or repair. 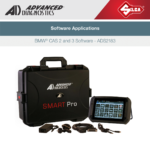 They are an integral part of industrial safety measures and are of equal importance in any environment housing heavy machinery or electrical installations. Insurance Padlocks are rarely made with levers any longer and often insurance companies are confusing the standards for doors locks with padlocks. This basically means the lock has at least 5 spring loaded pins which lift up and down depending on the shape of your key. 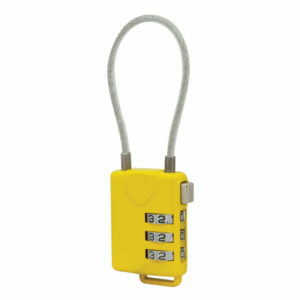 Marine Coated Padlocks are specially designed for outdoor use. They are 100 percent rust-free, and guarantee high security even in harsh weather conditions. Suitable weather-resistant materials such as stainless steel or appropriate plasticcoatings protect the padlock effectively in outdoor areas. Nylon Padlocks. Manufactured with solid aluminium body and shackles, our padlocks are amazingly lightweight and rugged. Locks are chemical and corrosion resistant and feature 5-pin cylinders for better tamper resistance. Padlocks are supplied keyed different. PMU Padlocks with a stainless steel shackle makes an excellent lock for applications where moisture is a problem or will be present. They come with hardened boron steel shackles that are zinc plated. The lock cylinder uses the Abloy disc locking principle that can use a patented key and keyway. TITALIUM™ padlocks, from security specialist ABUS, represent a new dimension in security. Made from an innovative material, they represent high security at a significantly reduced weight. The TITALIUM™ material is a special aluminium alloy that uniquely combines a high level of torsion with lightness. Travel Padlocks or luggage locks is a lock used to prevent luggage from opening by accident, usually with little or no security in mind, although they may serve as a deterrent to potential thieves. They may be built into luggage, or may be external locks such as padlocks or lockable straps. Weather Resistant Padlocks thermoplastic shell is designed to withstand the elements for outdoor protection against moisture, dirt & grime. Dual locking levers provide additional pry resistance and a 4-pin cylinder adds pick resistance. 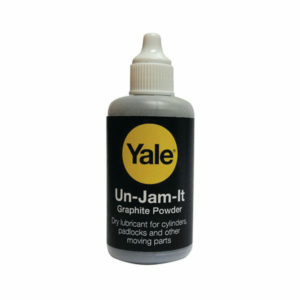 Un-Jam-It is a special dry lubricant ideal for cylinders, padlocks and other... Unlike most oil or grease lubricants, Un-Jam-It does not attract dust and dirt.